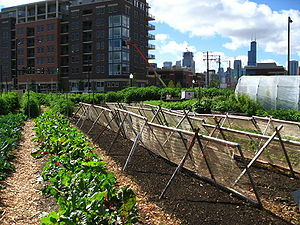 Urban farms: anyone can connect food with need! spots dot urban landscapes, while a quarter of traditional agricultural land is severely degraded according to the UN. Enter the urban farm: a fast, smart, cheap way to bring healthy food closer to those who need it, transform ugly vacant spaces into lush gardens, and promote a healthier, greener, more connected urban community. Plant a garden in your own yard (or farm the job out to someone else). Acres of perfect green grass are both a hassle to maintain and, nutritionally speaking, useless. Inhabitants with yards in D.C. and Portland can even lease their yard to those with greener thumbs–and take a cut of the produce they yield. Populate empty lots with crops. Cities like Cleveland and Detroit are leasing abandoned lots to urban farmers for practically nothing–provided the lessees are committed to filling those spots with edible greenery. If your lot’s soil is poisoned with lead or other contaminants, simply truck in new soil in raised beds. Even cheaper: Plant your veggies in burlap bags filled with clean soil. Roll the sacks up and fill with more soil as the plants grow, and you can transport them indoors when winter hits. ASLA’s video suggests restaurants harness their roofs to grow ingredients for their own meals. Big-box stores can lease or farm their own vast roofs and sell the proceeds in-store or via local greenmarkets. 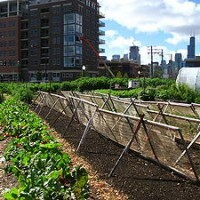 Rooftop farms use wasted space and lower your utility bill, too. Fill up your food trucks. Mobile trucks sell prepared foods–often unhealthy at that. Why not use them as fresh-fruit stands? Food truck legislation in many cities has relaxed in recent years. Opportunity knocks, suburban farmers: Coordinate with a food truck owner to sell your produce wherever there’s a need in your city–not just at the Saturday greenmarket. Hook the kids on juicy berries or watermelon in summer, and you may make a confirmed veggie fan year-round.